Emma Plotkin talks to Grainne O Carroll founding member of the group Dance Among Other Things. Their newest play is called The PeopleSway. O Carroll delves into the process of creating a promenade show, the importance of bringing communities together and why art is needed in Dublin now, more than ever. “A devised, immersive movement-theatre piece transforms the ordinary into the extraordinary. 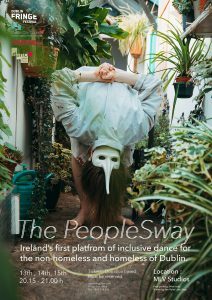 The PeopleSway shares stories of the heart, home and homeless in Ireland, revealing beautiful communal truths no longer only at the fringes.